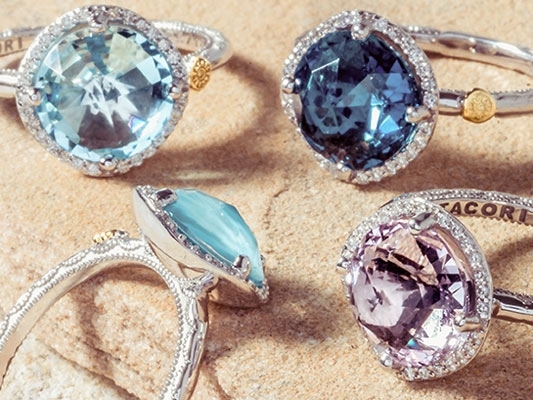 The rings in Tacori’s 18K925 instantly make a statement. These cocktail gold and silver rings are simply stunning, perfect when worn alone or as a set with one of the Necklaces or Bracelets from this collection. With simple solitaire settings to three or four stone rings, these rings are available in every color of the rainbow. From fiery citrine to earthy rutilated quartz, Barbados blue quartz to inky black onyx, these perfectly cut gemstones are undoubtedly the star attraction on any finger. For a spot of elegance, the moon rose is an unconventionally classic choice, though, for a bit of edge, it’s impossible to go wrong with a black onyx ring from the City Lights Collection.